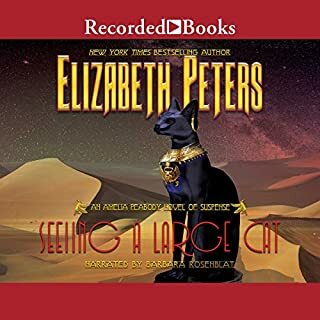 Elizabeth Peters brings back beloved Egyptologist and amateur sleuth Amelia Peabody in an exciting tale set amid the ancient temples and simmering religious tensions of Palestine on the eve of World War I. 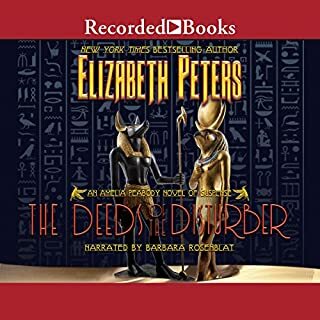 Once again the Peabody-Emerson clan must use all their skills and wiles to find the truth, prevent a bloody holy war, and save their son from the clutches of a nefarious enemy in this wonderfully engaging tale chock-full of thrills, mystery, and daring from the inimitable Elizabeth Peters. 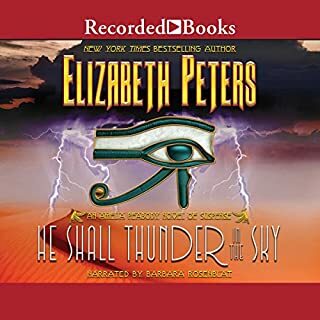 New York Times best-selling master of suspense, Elizabeth Peters, brings an exotic world of adventure, intrigue, and danger to vivid life, in a tale as powerful as ancient Egypt. A new year, 1917, is dawning, and the Great War that ravages the world shows no sign of abating. 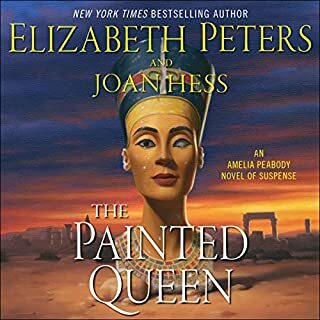 Answering the siren call of Egypt once more, Amelia Peabody and her family arrive at their home in Luxor to learn of a new royal tomb ransacked by thieves. Soon an even more disturbing outrage concerns the intrepid clan of archaeologists: the freshly and savagely slain corpse of a thief defiling the ancient burial site. Yet this is nothing compared with the lethal fate that threatens Ramses. Undeterred by world war and enemy submarines, Amelia and Emerson set sail once again for Egypt, where ghosts of an ancient past and spectres of a present-day evil hover silently over an inscrutable land. In the autumn of 1915 Cairo is transformed into an army camp teeming with enemy agents and shockingly bold tomb robbers are brazenly desecrating the ancient sites. 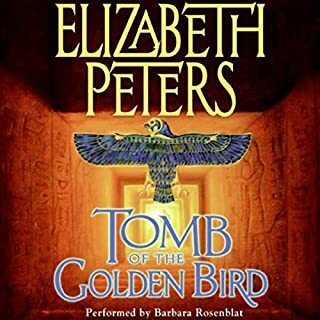 Amelia seeks refuge at a remote dig in Luxor, but this provides no guarantee of safety when she discovers a fresh corpse in an ancient tomb. The Great War has ended at last. Archaeologist Amelia Peabody and her husband, Emerson, the distinguished Egyptologist, no longer fear for the life of their daring son, Ramses, now free from his dangerous wartime obligations to British Intelligence. Delightful new additions to the growing Emerson family and new wonders waiting to be discovered beneath the shifting Egyptian sands mark a time of new beginnings in Luxor. Against the romantic backdrop of Edwardian Egypt, the irresistible Amelia Peabody and her charmingly unconventional family prove themselves to be formidable foes of villainy. 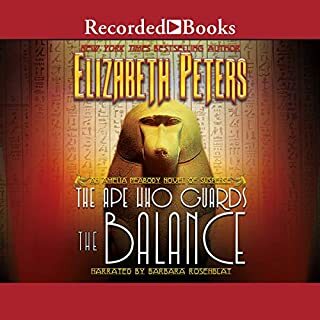 In The Ape Who Guards the Balance, Amelia must muster all of her considerable skills of detection to unravel a snarled web of stolen archeological treasures, murderous cults, and fallen women. Join spunky Amelia and her charming family for a thrilling new archaeological adventure in Edwardian Egypt. Even on the joyous occasion of the marriage of their Egyptian "son" David to their beloved niece Lia, trouble finds Amelia and hunky hubby Emerson. And this time it is personal. Convinced that the tomb of the little-known King Tutankhamen lies somewhere in the Valley of the Kings, eminent Egyptologist Radcliffe Emerson and his intrepid wife, Amelia Peabody, seem to have hit a wall. Having been banned forever from the East Valley, Emerson, against Amelia's advice, has tried desperately to persuade Lord Carnarvon and Howard Carter to relinquish their digging rights. Arriving in Cairo for another thrilling excavation season, Amelia is relaxing in a well-earned bubble bath in her elegant hotel suite in Cairo when a man with a knife protruding from his back staggers into the bath chamber and utters a single word - "murder" - before collapsing on the tiled floor, dead. Among the few possessions he carried was a sheet of paper with Amelia's name and room number. 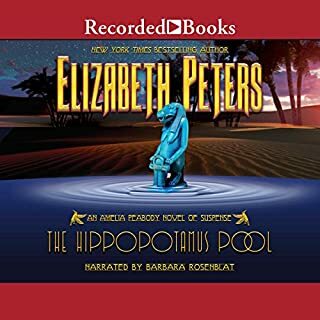 The spunky Victorian Egyptologist Amelia Peabody Emerson has returned to the exotic Nile valley. 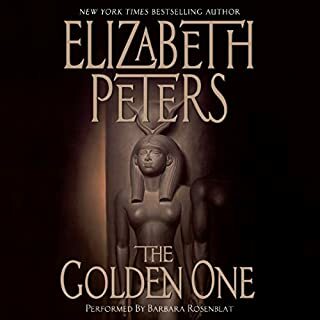 Parasol aloft and hot on the trail of an unexplored tomb, she must outwit a shadowy evildoer, a questionable antiquities dealer, and her loquacious son, Ramses. 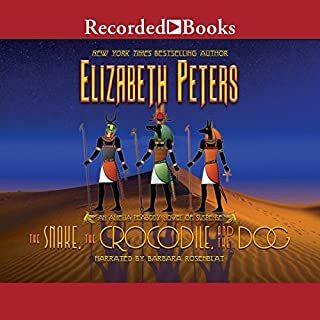 This adventure transports Amelia Peabody and her husband Emerson to Amarna, the rustic desert site where the two archaeologists first met, beginning the 13-year association that would take them from mayhem to murder in the Egyptian outback. Amelia and Emerson leave the calm of Victorian England in search of an estranged father's son and a lost kingdom buried deep in Sudan. After an adventurous season spent excavating at Dahshoor, and narrowly averting the clutches of the Master Criminal, Victorian Egyptologist Amelia Peabody Emerson and her spouse prepare for a quiet summer in England. The social and domestic routine, though interrupted by the precocious escapades of their only child, Ramses, hardly seems much of a challenge for the indomitable Emersons. The indomitable Amelia Peabody and her husband, known to many as "the Father of Curses", are into archaeology and mischief again. This third in the series brings the reader once more into Egypt and the shady world of black market antiquities. The winter excavation season has hardly yet begun when Amelia stumbles onto what looks suspiciously like a ring of thieves. 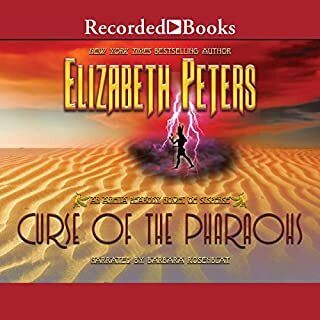 The sun rides high over the British Empire and the light still sparkles brightly in Amelia Peabody's eye as she returns for her second adventure in archaeology and romantic mystery as recounted in her lively journal, The Curse of the Pharaohs. Amelia Peabody, archaeologist and woman extraordinaire, should have greeted the approaching excavation with transports of joy. Nothing in the world could compare with exploring the muddy, musty corridors of some bat-infested pyramid. And at Dahshoor, to which she was headed, there existed some particularly fine specimens. A lost journal of Amelia Peabody has been miraculously recovered: a chronicle from one of the "missing years", 1907-1908, shedding light on an already exceptional career...and an unexpected terror. 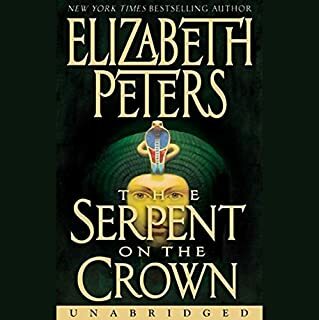 Ousted from their most recent archaeological dig and banned forever from the Valley of the Kings, the Emersons are spending a quiet summer at home in Kent, England, when a mysterious messenger arrives. Claiming to be the teenage brother of their dear friend, Tarek, he brings troubling news of a strange malady that has struck down Tarek's heir and conveys his brother's urgent need for help only the Emersons can provide. The family sets off in secret for the mountain fortress from which they narrowly escaped 10 years before. The Emersons are unaware that deception and treachery are leading them onward into a nest of vipers, where a dreadful fate may await. For young Ramses, forced to keep his growing love for the beautiful Nefret secret, temptation along the way may prove his ultimate undoing. And a dark past and grim obligation have ensnared Nefret once again, as she is helpless to save those she loves most from the prison of the Lost Oasis. 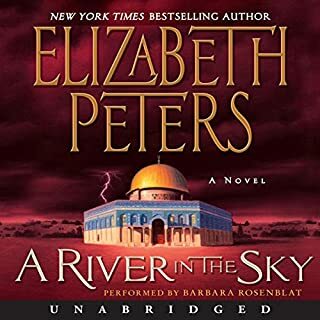 Rich with suspense, surprises, unforgettable characters, and the intoxicating atmosphere that has earned her the coveted title of Grand Master two times over, the remarkable Elizabeth Peters proves once again that in the world of historical adventure fiction, she is truly without peer. 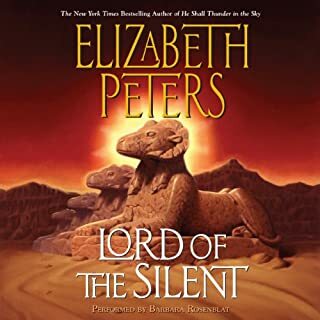 ©2004 Elizabeth Peters (P)2004 HarperCollins Publishers, Inc. The Emersons Are Back to Their Old Tricks! 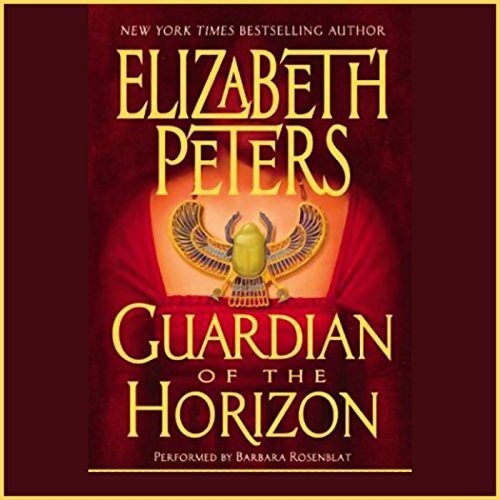 Guardian of the Horizon is a worthy sequel to The Last Camel Died at Noon. I suggest reading the prior book first since much of the plot of this book is built on previous incidents and relationships. Although there is enough of a back story in Guardian of the Horizon to allow it to stand on its own. The Emersons return to The Lost Oasis where they are once again called to duty to help overthrow the usurper of the Holy City, and restore the rightful king to the throne. The story is full of zany characters and screwball antics, and there are loads of laughs along the way. The book starts out a bit slow, but in the end you can't help but fall in love with the madcap Emersons. If you're a diehard fan, you'll fall in love with them all over again. 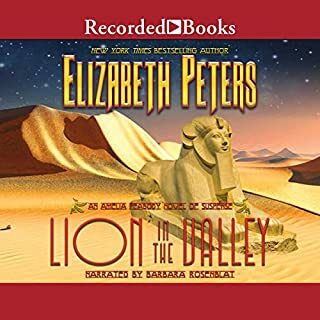 The truly talented narrator brings each charater to life in this gem of the Amelia Peabody series. Four stars for being one of my favorite books in the series. I was so glad to read this book. All during the Last Camel Died at Noon, I kept expecting the things from this book to happen. I'd forgotten this was a whole other book! As always, I LOVE this series. I really like the lost oasis and its characters. I think it would be very interesting to find such a place. My favorite character shows up too. Sigh... He is the most lovable villain ever!! Of course, Amelia puts him in his place. 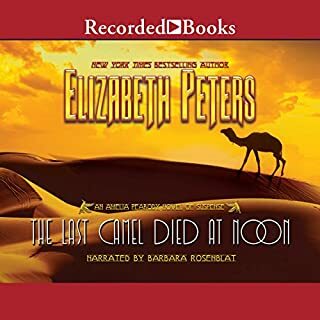 If you have'nt read, the Last Camel Died at Noon, you might want to read it first, but you wouldn't have to to fall in love with the blustering Emerson, unquenchable Amelia, risk-taking Ramses, and darling Neferet. This whole series is just marvelous. Another wonderful experience with the Emersons. I have to admit I have a bit of a crush on Ramses. Back when he was just a lad, he was always a delight: smart, funny, handy to have on an adventure...But now as a young person, he is pretty much everything you might want in a man. But all in the clan are lovable. Barbara Rosenblat is the only Peabody as far as I am concerned. I only wish that audible had the complete series unabridged narrated by her. They have most but not all. I am not sure why some people have criticized her, she simply IS Peabody. I have not enjoyed her reading the Vicky Bliss series. She seems to do better with an English accent. All in all, listening to these novels lifts my spirits. This series is a favorite. The history is reliable, the style is authentic, and the plots are engaging. The the characters are likable and amusing; their development and their changing relationships piques interest in the ongoing saga. A great plus in the audio versions is the amazing Barbara Rosenblat, who gives each character a distinctive and convincing voice. I'd say this entry is better than average. Not as epic as the Emersons' first visit, but definitely better written, with better pacing and more memorable characters. I don't particularly care for Ramses' activities during this one, but I suppose you have to let a character make some mistakes. Listen to them all, but only if Barbara Rosenblat is narrating. Every one of them is great. Love this series! Great car listening. I sometimes sit in my driveway to listen to the end of a section. . I am only sorry I am reaching the end of the series. If you haven’t listened to them, do so. I recommend doing so in order to best follow the characters development. Always choose the ones with Barbara Rosenblatt as narrator. I love this Amelia Peabody series by Elizabeth Peters. 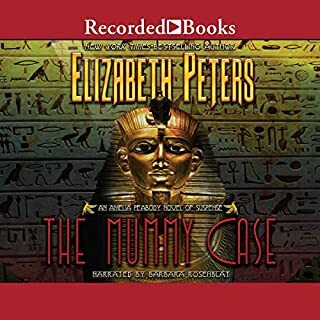 Amelia is an egyptologist living and working at the end of the 1800's and early 1900's, and these fun mysteries follow her and her family's adventures in the form of her journals and family letters. 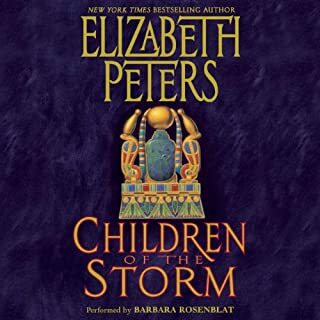 This particular book is listed as book 16, probably because that is the order the books were written in, but if you want to follow the adventures in the order they happen for the characters, this is really book 11. Wikipedia has a list of the books according to the dated "journals" so you can listen or read in order. 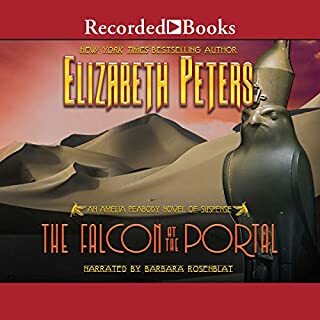 The performance in this audio book is great - so far the same voice artist as in the past books and hopefully for all the future books - there are about 20 books in the series. I was about to give this book a less happy review, because my ClipJam stopped before the end, but I went to iTunes to check and its all there, so no worries that you'll miss anything if you buy this book. These really are great stories! i couldn't stop listening once i started the book. loved every minute of it. the Emerson's sure know how to have a great adventure.